Keith B. Jones is more than your average business owner. 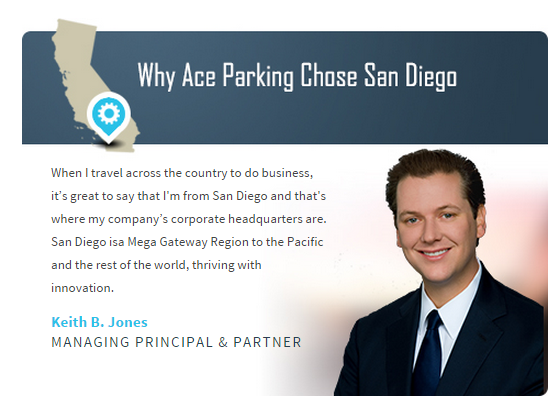 As managing principal and partner of Ace Parking, he knows San Diego very well. Jones’ family and Ace Parking have called San Diego home for three generations. He has witnessed San Diego evolve into a world-class city. The way he sees it, if we want to continue to be a “gateway to the Pacific” we must rethink the way we see space in downtown San Diego and beyond. EDC sat down with him to talk about why Ace is proud to call San Diego home and how he sees the future of the region. Ace Parking is the last of the family owned and run parking companies that operates across the United States. Our clients hire Ace Parking because we are the industry leaders in delivering memorable customer service experiences, increasing parking revenue returns and embracing new technologies to ensure objectives are being met. We are able to differentiate ourselves from our competition because there really is a heart and soul behind our family firm. We approach all of our clients as if we are going to do business together for the next 30 years, therefore we strive to always operate with integrity and honesty. What are some advantages of doing business in San Diego? When I travel across the country to do business, it’s great to say that I'm from San Diego and that's where my company’s corporate headquarters are. I love promoting San Diego and talking about more than just our weather. People are interested and intrigued when I say we are not a cul-de-sac at the end of the road; San Diego is actually a Mega Gateway Region to the Pacific and the rest of the world, thriving with innovation. I love the fact that my office has been located in downtown San Diego for over 65 years. San Diego is full of dynamic companies, firms and service providers influencing global trends and innovation. Pick another San Diego company that is at the top of its game. I'm a big fan of other family companies, and I think the Spanos family is truly on top of their game. A.G. Spanos is now the CEO of the Chargers and it's amazing to see how dedicated this family and organization is to the San Diego community. They truly do want to live, work and play here. We must recognize the power of being an NFL city and do more to help them achieve their business goals within our region, so they can stay committed to having their team located in San Diego. Another local company doing amazing and visionary things is OliverMcMillan. Dene Oliver, CEO, and Paul Buss, President of OM, are both at the top of their game. Their firm is widely admired for building exciting, breathtaking mixed-use projects all across the country. OliverMcMillan is a great ambassador of San Diego and is now considered the gold standard in transformational design and urban mega-block redevelopment in the United States. What do you anticipate for your company in five years? In five years I want to remain a thriving, civically engaged family owned and operated company. My belief is that if you uphold your team members and clients as paramount to your organization, then good things will happen both to the organization and to our customers. What do you anticipate for San Diego? San Diego needs to embrace that we have pressures on our infrastructure and must work as a community. We need to start making progress toward building up and growing up. If we accept regulation and prohibitive growth policies, then great opportunities that are currently in our region and those that may otherwise be attracted to our region will be forced to go elsewhere. The civic leaders we have in our community are very intelligent and capable individuals. I'm excited to be part of the strategic dialogue as we transform our region.